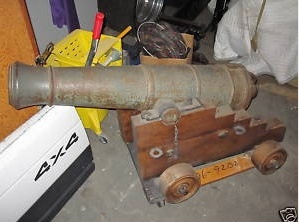 On Ebay, a British naval cannon is up for auction. Looks authentic anyway, and the current bid is $9,500. The item is described as a ship's cannon from the 1700's on the Blomefield pattern. The seller claims that even the carriage is authentic, rebuilt from the original parts, down to the oak wheels.